The few unrelated to the Yankees posts I’ll make usually will be about the New York Knicks. This is one of them. Just about every Knicks fan I know wants their team to sign uber free agent LeBron James. 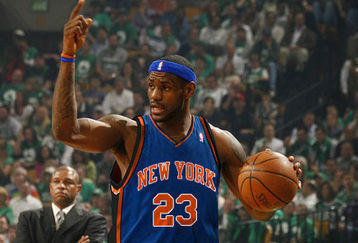 Knicks president Donnie Walsh is looking for any New Yorkers to help him recruit James to The Big Apple. “If there’s Yankees that want to help us, we would involve them,” Walsh told the New York Post on Sunday. To no surprise, Yankees captain Derek Jeter wanted nothing to do with recruiting James. On the other hand, as a New York fan, don’t you want Jeter to sound a little more welcoming? Why does Jeter always have to play dumb? Jeter certainly would have a lot of helpful information for LeBron about the city of New York and could be a good recruiter. This is a perfect example of Jeter avoiding any major press item. There’s just no way any reporter is going to get Jeter to talk about his personal life or anything unrelated to winning games for the Yankees. Even if Jeter is in contact with LeBron (I think he will be), he will do his very best to keep that away from the media’s hands. That’s just the way he is. And that’s why we love him. Right?